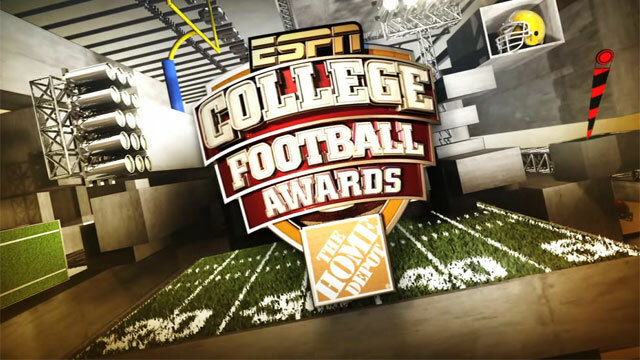 Nobody likes a made-for-TV event quite like me and we have a doozy of one tonight with the College Football Awards program tonight from Walt Disney World. Here are my predictions for who will go home with the hardware. - Can somebody explain to me how Jace Amaro of Texas Tech was not even nominated? Anyways, save for Amaro, Ebron has the most catches out of any tight end and has been a key weapon Larry Fedora's fast-paced offensive scheme. - This is traditionally an award dominated by seniors and Ikard certainly fits the bill after an awesome senior campaign in Norman. - No matter how many times the Tigers stalled offensively, which was often, Hornsey was able to bail them out with precision, averaging over 45 yards a punt on 62 tries. - Aguayo may be a freshman but he was sensation for the Seminoles this year, setting an ACC record with 142 points. - This is an easy choice, Donald was a monster this year for Pitt. He put up ten sacks, 26.5 tackles for loss and forced four fumbles. He was all but a one man defense. - This is a tough call as all three are strong candidates but for a defense that took some major steps forward, Joyner was leading the way in Tallahassee. - All three were horses in 2013, but there is no question that Williams has made the biggest impact on his team, and also eclipsed the rare 2,000 yardage mark. - This came down to Donald and Mosley, but I ultimately went with Mosley who did it all at linebacker for yet another potent Alabama defense. - All three had tremendous seasons and would all make fine selections, but Cooks' production has been insane. - There have only been two repeat winners of the O'Brien Award, the great Ty Detmer and Jason White. You will be adding Johnny Manziel to that list because he may just have had a better season than his Heisman campaign of a year ago. - Is there really a doubt of who was the best player in college football in 2013?